Lets start this off by saying it's been was a crappy evening. It was goose-bump raising chilly evening with my partners in culinary exploration. To add on top of the dreariness, Taiwan's bi-polar weather decided to pour on us. We decided on a late dinner because we had a late lunch. So as everyone else was happy and warm inside their restaurants eating their meals, we were wandering the streets killing time, walking off the last of our luncheon meal. Our first choice was to just have something light, to compensate for the lack of hunger. However walking over to Yuki's favorite shabu shabu place in Dongqu came with disappointment as the store was closed for the holidays. So we turned tail and headed back to the main street. Everyone was thinking of a place to eat at, but we couldn't decide on a single place or knew of a local place we wanted to go to. Undecided in mind, we continued to walk around and check store by store. Things were looking dim, rainy, closed and late. Until we encountered a unique little 8 story building. Yuki said it reminded her of a japanese building. Narrow and tall, which each restaurant taking up a flat (one story). There was no lobby or hallways, the elevator is the front door. Sorry, that the best I can describe it. We ended up on the top floor of Bistro 98 (I'm not sure if thats the building name, but it is in the address). It as called Mala village (麻辣一材). After all that disappointment and walking, we went from not that hungry to I can eat four horses. 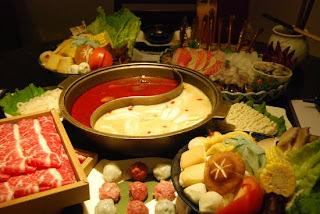 So even at the price rate of $500+10% tip, we signed up for some All-You-Can-Eat hot pot. This AYCE place orders by menu, but buffet. You get 3 orders, so don't worry about over ordering on the first round. Food wise...awesome! They have several meat types and cuts. Several seafood choices, vegetable choices and mushroom choices. The sauce bar is eclectic! They have about 40 bowls of ingredients, so you can customize your dipping sauce to your hearts content. Moving on to the desserts. They have Meiji and some russian brand ice cream. But the topper is, freshly made waffles. Top your waffle with some ice cream for that ultimate hot and cold marriage. Thats what we did! As for the environment, It's a small place, but it's fairly clean. Although they have nice big windows to view outside from the 8th floor, due to insufficient ventilation, the humidity fogs over much of the window. Overall an excellent and cute little place. I feel that it is less popular and more hidden, so it may be a great option when other restaurants in the Dongqu area are packed. However I ate my self full 'till my jean button burst. My Chinese New Years resolution is: No more AYCE...under my own free decision. So this may be the last AYCE hot pot for a while, I'd glad Mala Village made it a good experience for me. Now to take a quick shower, hop into bed and cradle my stomach in a fetal position.